The report indicated there are a growing number of escalator injuries in the U.S. every year, most involving children or the elderly, and a significant number involving not entrapment, but falls. There are reportedly 18 escalator accidents to every 1 elevator accident, and escalator injuries in the U.S. have been steadily climbing since the 1990s. In 1990, there were reportedly 4,900 escalator accident injuries and fatalities. That figure increased by roughly 10 percent annually over the years. By 2000, it had reached more than 10,100 escalator accident injuries and deaths. Then in 2013, there were a reported 12,260 escalator-related injuries and deaths. More than 60 percent of these incidents involved either children who were under 14 or persons over the age of 65 – grossly disproportionate to their actual presence in the population. Between 1990 and 2002, there were more than 26,000 escalator injuries among children 0 to 19 treated in hospital emergency rooms. What we know from the Consumer Product Safety Commission’s (CPSC) reports on the issue is that two-thirds of all escalator injuries involve not entrapments, but falls. Falls were also overwhelmingly the cause of child deaths on escalators. Of the 27 fatal escalator injuries reported from 1985 to 1999, a total of 21 were caused by falls. 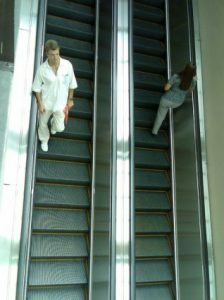 The Massachusetts escalator injury case from a couple years ago shows us this is not a problem that has gone away. So why don’t we hear more about these incidents? Well, the American Association for Justice article pointed out few people may be initiating litigation where it’s merited because the industry has done such a stellar job of making it seem as if the victims are to blame. We hear about the entrapment cases, but the falls? Defendants and the industry in general will allege that victims were wearing the wrong shoes or they were horsing around or they were drunk. 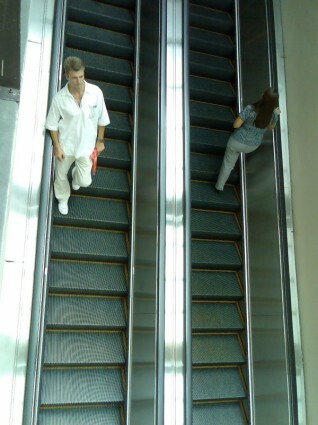 When escalator manufacturers or maintenance crews are successful in convincing escalator accident investigators of this, the true cause or other factors may be obscured or never fully uncovered. The reality is that many of these escalators are defectively designed and improperly maintained. In many cases, it is the manufacturer that provides on-going maintenance for these machines, and sometimes those contracts are even more lucrative than the initial sale of the escalator itself. Those who have suffered injury on an escalator should explore whether legal action is viable in their case because escalator manufacturers, maintenance companies and owners need to be held to account when the equipment is unsafe for the public.